Many of my friends and family are enduring a very bad blizzard in the Northeast this week. In thinking about them, I drew this little picture that I wanted to share with you. 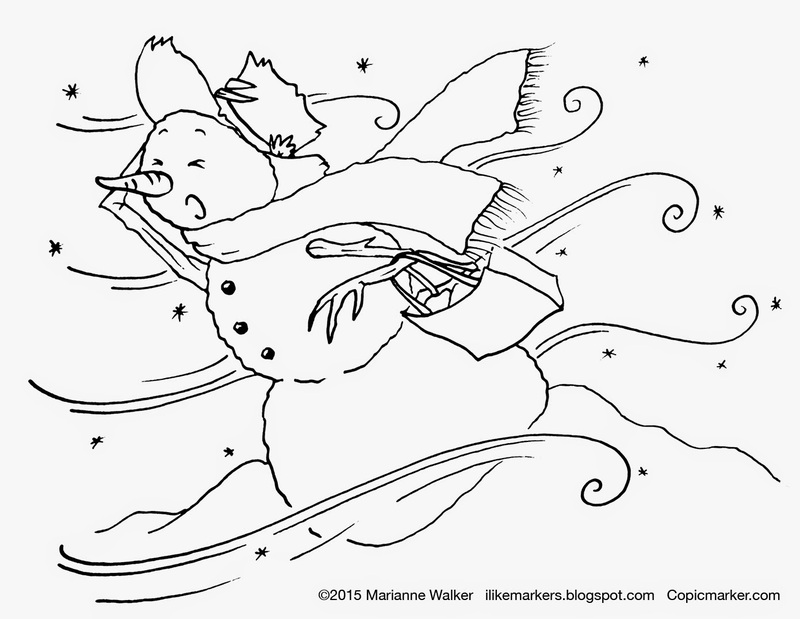 If you are stranded in your home, but you still have heat, electricity, and the ability to color, maybe coloring this snowman will give you something to fill your hours. So, from my desk to you, please enjoy this free digi image. May you be warm and cozy, and have no reason to brave the elements this week! Over the next few months I will be a lot of places in Oregon. If you live nearby, I'd love to see you at one of my events. I have classes I'll be teaching to adults, teens, and kids, so be sure to check it out! Saturday, Jan 24th Tigard, OR Coloring classes at Main Street Stamping and Stationary in Tigard, OR. Contact their store for more information and to register. Saturday, Feb. 7th Springfield, OR Springfield Public Library 11am to 1pm, Tracing Memories class for adults. We will be coloring images from around Lane County. Saturday, Feb 28th Tigard, OR Coloring classes at Main Street Stamping and Stationary in Tigard, OR. Contact their store for more information and to register. 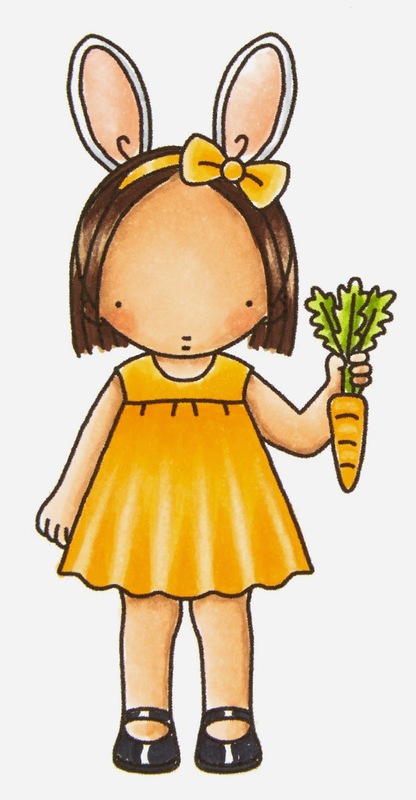 I will teach coloring Easter Images, Tracing Memories, and Airbrushing. Thursday, March 5 Eugene, OR U of O Bookstore, main campus location, Proudly Oregon event. I'll be making some great marker drawings and answering questions. (the photo is from last year's demo, where I am coloring a photo line art of a building on the U of O campus). Saturday, March 14 Eugene, OR Girls Rule! for girls ages 9-14 and a caring adult. I'll be teaching some fun drawing workshops. More info later. 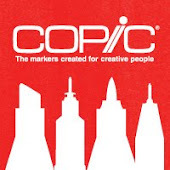 We have a new Copic website! 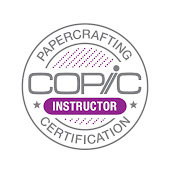 Visit the Copic classes website for a full list of 2015 classes and locations near you. Scroll down the page to see all the workshops and which classes are open now and which classes will be opening soon, since we have most of the year already posted. Note: if you take all three workshops in a location on one weekend, you get a $50 discount! See website for more info. 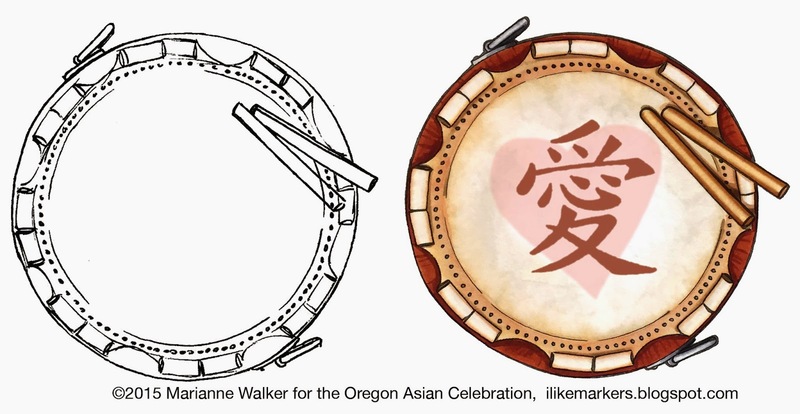 Once again, I want to share my artwork created for the Oregon Asian Celebration. Each year, I am honored to work with the celebration on some great illustrations. This is their 30th anniversary, and this is the 10th year in a row that I have had the honor of creating their artwork! I am so excited to be a part of this event. This year, the theme was Celebrating 30 Years of Love and Diversity. In brainstorming for the design, I asked myself, "What do I think of when I attend the celebration?" That's easy! 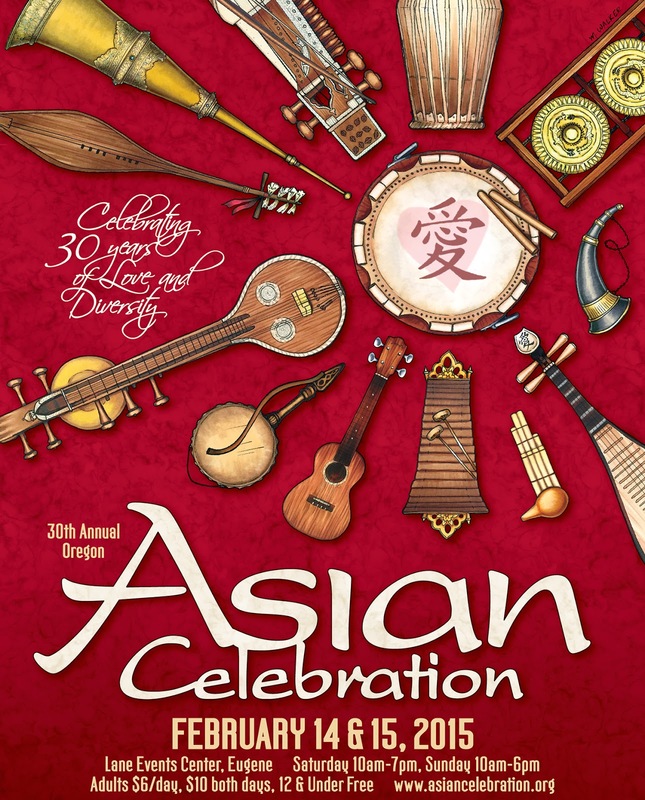 The food, the music, the vendors and the variety...variety of people, of cultures, of art, and amazing performances. We've shown the diversity of the people before, and as much as I would love to draw a yummy plate of all the foods you can find at the celebration, we decided to work with the theme of music from around Asia and the Pacific islands. 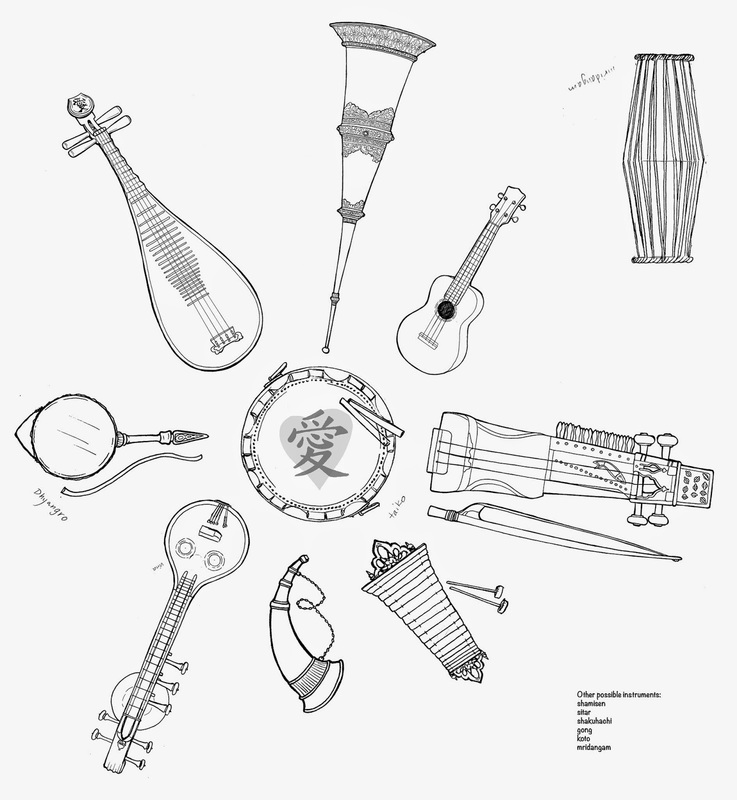 This year's poster is a compilation of 13 instruments from different countries. Each instrument is a separate, detailed marker rendering. Center: Taiko Drum with the Kanji for "love"
With any of my work, especially with a client that I am trying to explain a concept to, I start with a rough sketch. Not very detailed, just enough to convey the idea. Here is the first pen sketch for the client. Needless to say, they were a little skeptical when seeing this sketch. But after they were receptive to the initial idea, I made a slightly more refined sketch, not with final drawings, just showing more details. At this point, the Celebration committee added input about instruments and countries represented by the instruments, so I had enough direction to make the final sketches. 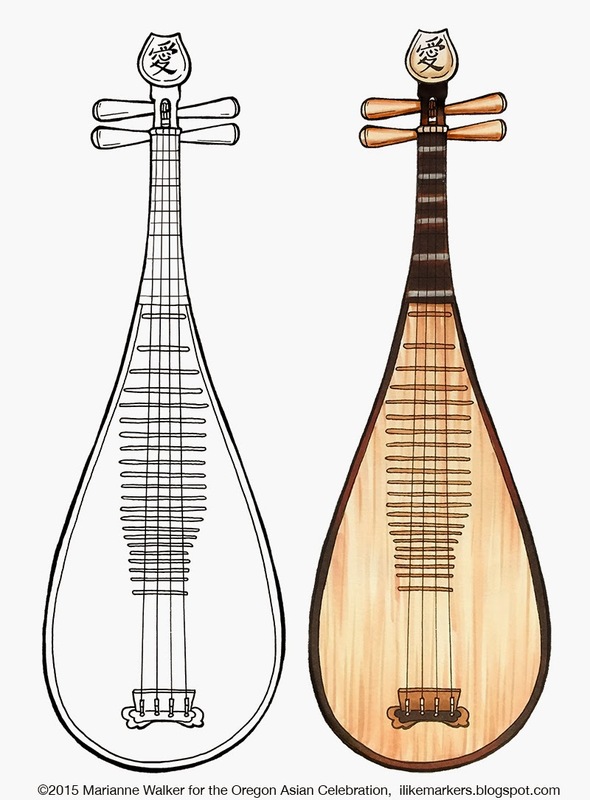 For each instrument, I looked at extensive reference photos on the internet. Then I drew a top-view in pencil, traced it on my light table in multiliner, then scanned it into the computer. I fixed any line work that was wrong, then I scaled it to the size I needed (about 2x what the final artwork would be, so it had plenty of detail). I printed each instrument on nice paper so I could color it. It took me probably 2-4 hrs. per instrument to make this drawing. Here are a few of the more complex instruments for you to see up close. All of these instruments are colored with Copic markers. I used a bunch of colors, so I can't tell you exactly what colors I used where. Most of the instruments had a variation of wood texture. You can find many tutorials on this blog for coloring wood, just run a quick search. iIt seems like I used every E marker that Copic makes when coloring these instruments. 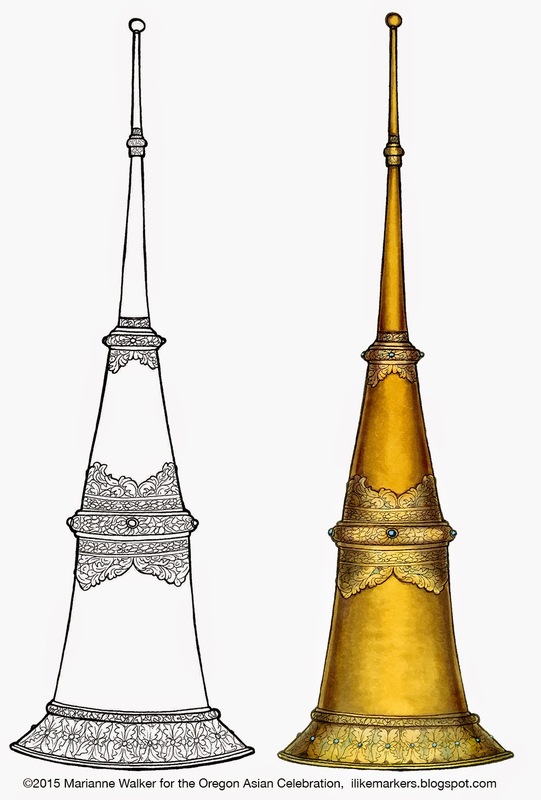 The brass trumpet was colored with a nice range of yellows and browns. I faded out the highlights on the ornate areas with the colorless blender. The little blue gemstones were tricky to keep clean while I was blending all the other colors around them. The leather texture on the Taiko drum was made with the colorless blender, pushing color out. The only digital addition is the pink heart and the Kanji symbol for "love". If you live in Oregon, I hope you can make it to Eugene for the celebration. 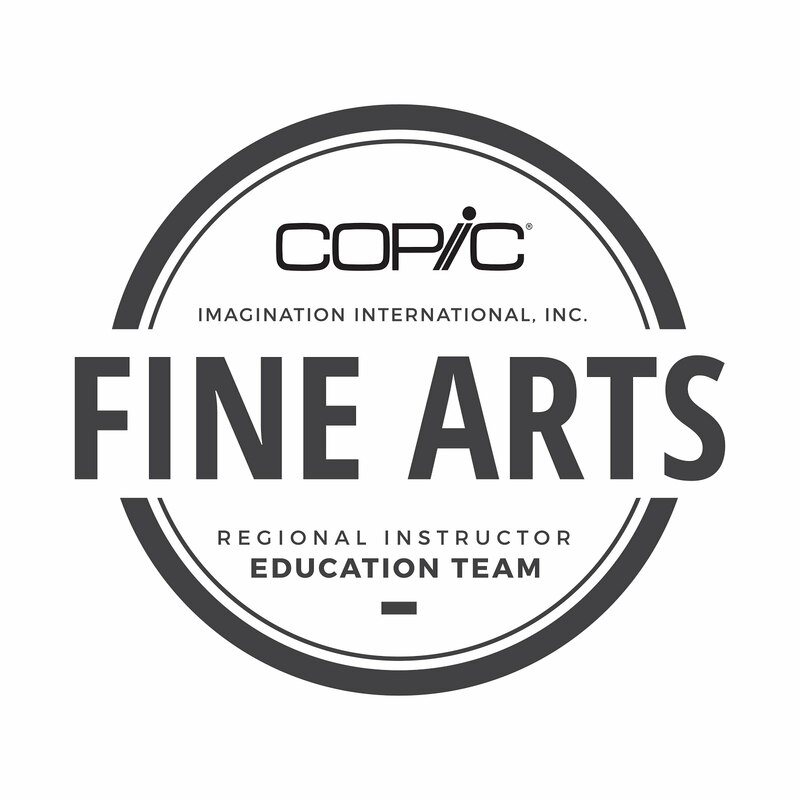 Each afternoon, Copic will be sponsoring a table in the Youth Art area. You can come and color your own instruments, or artwork from the past years that I have drawn. See you there, Feb 14 & 15th.